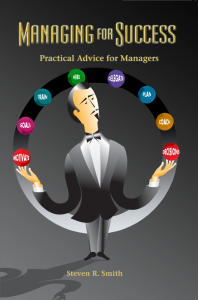 Managing for Success: Practical Advice for Managers joins others in the business book category that presumes most managers need help in their job: this one citing statistics that some forty percent of new managers fail. Many managers and supervisors receive their designation due to success in their professions and expertise in their fields; but as managers they have a lot to learn, and that’s where Managing for Success comes in. It presumes such a scenario and answers common questions, addressing typical dilemmas of this group. It covers the very different skillsets required in managerial positions and talks about the best ideas author Steven R. Smith applied during his own tenure as a manager. It outlines the common routines of the job and how to handle typical challenges, providing the tools needed to handle individuals, teams, bosses, and corporate structures alike. All this is based on the author’s 42 years of observation at more than 15 companies, assessing why qualified managers ultimately failed at handling people and departments. The nuggets of wisdom gleaned from this entire experience are embedded into a daily guide for mangers of white-collar workers and they pinpoint the practices that lead to either success or failure. Chapters avoid your typical theory-and-case-history pairings to streamline information for busy business people who are simply seeking the nuts and bolts of applied management basics. They emphasize that technical training alone does not lead to good management practices: these embody a different set of skills and require specific management practice training, provided here in Managing for Success. Clear ideas and approaches outlined by Steven R. Smith can easily be applied to any management scenario, while each chapter holds titles and statements that lend to quick browser reference as well as complete reading. Want to motivate your staff? Then ‘Managing Motivation’ is the chapter of choice, outlining how motivation can be either stimulated or suppressed. Want to better manage individuals? Then ‘Individual Management’ is recommended, covering everything from the basics of a superior job description (to include measurable metrics expected from an ideal candidate and how top performance is defined) to creating a ‘responsibility table’ to better monitor goals, department workflow, and appropriate job assignments. Have a difficult boss and want to extend management practices to handling conflict? Managing for Success tackles even this difficult subject with ease, from how to question bad decisions without jettisoning one’s career to building a good relationship with a difficult boss. It’s all here: all that’s required is that supervisors and managers be able to acknowledge that more effective management skillsets can be gleaned from the right combination of experience and logical lessons. Managing for Success provides the latter: with it, new managers can step up to the plate and get on track quickly before any other moves are made in the workplace.